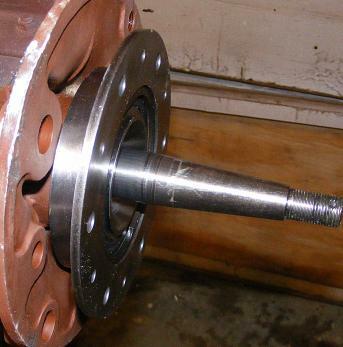 I have been having trouble with my rear axle eating up the outer bearing surface of my axles. Well, I have the axle apart again and decided to add a set of safety hubs hoping that this would correct this problem. Well.... I decided to hone the outer sleeve tube, the sleeve tube in the backing plate casting. The reason I wanted to do this was to clean up any burrs that may cut up the new rubber o-rings on my new safety hubs. I used my cylinder hone and only did it lightly. It polished up the surface and revealed what looks like cracks. There are multiple cracks on each side. This is the largest one. But as I said there are a few of them, not just one. After looking closely at the construction of the axle housing, it looks like the sleeve tube is pressed into backing plate casting. 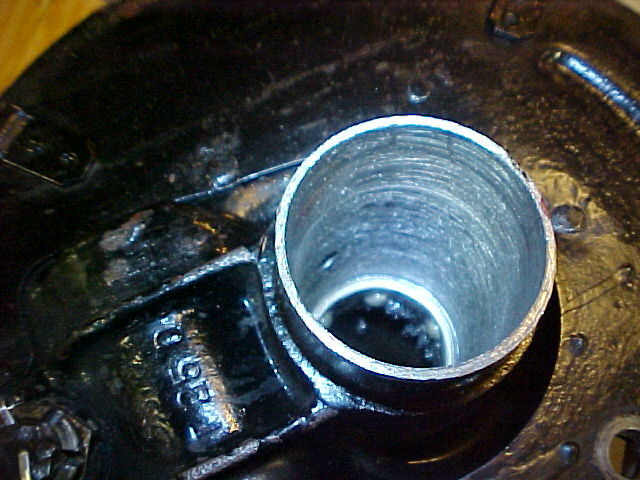 The axle tube that connects the differential to the backing plate casing is separate. Can these outer sleeve tubes, not the sleeves, be removed and replaced? Or, should I just look for a better axle housing? Oh yes! just check with a vendor (Lang's), they sell the sleeves and a tool to take out the old and instal the new. Bud these are not the sleeves. The sleeves are already out. This is the tube that the sleeve fits into. You call these the "outer sleeve tubes" but there is just one tube, it is continuous from the rear hub to the differential. The piece inside with the 6 rivets is a ring that keeps the roller bearing in place. 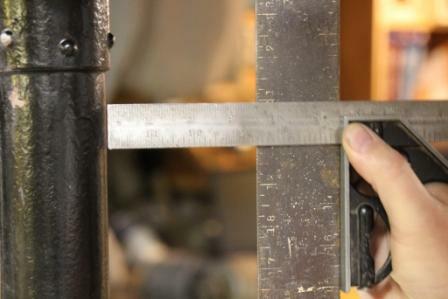 Measure the OD and ID of what is exposed in your pictures and compare with the tube between the differential casting and backing plate casting and compare that to the bit that pokes into the inside of the differential. I'd be looking for a different set of housings. They are all over the place and cheap. If you were closer I'd give you a set. Here's a set of safety hubs I installed in a Ruckstell that is still here, waiting to be shipped. The inside of the tube was pretty rough and since there is a little movement in and out by the safety hubs the O rings will need a smooth surface to run on. I spent at least an hour on each tube grinding those machining grooves out of the inside of the tube. You can't get it too large but there is room to clean it up a lot. These tubes had no cracks. I wouldn't like cracks. If your differential is assembled correctly with the right clearances there should not be more than .005 movement of the safety hub/O ring in the tube. Layden, exactly, I'm not sure. To me it looks like there are two tubes. Looking down the hole (my second picture) you can see the thick wall tube and a few of the rivets. There is definitely a lip just above the rivets. I assumed that there are two tubes. But I suppose that the thick wall tube could be machined down for the sleeve to fit. I don't know. Maybe that's why I can't find any replacement parts. Stan, thanks for the offer. My axle surface is also rough. The clearance you mention in your last sentence is between the tube and the hub? How would you measure that? If you remove the o-rings and install the hub, I don't see how a feeler could be inserted. Or... do you do it by feel? Well.... I think I'm on the look out for a different axle housing. I'm sure there are plenty here in Wisconsin, also. Thanks for the thoughts. I don't know why Stan doesn't use this as an excuse to drive to Wisconsin. We will set up a Model T University for him and he can tell us all about Ruxtells and carburetors. We will invite John Regan and Wally Sumowski, too. That should use up a full day. I have a pile of rear axle housings. If you know anyone coming to denver have them stop by and I will donate a pair of housings to you. Dave, I appreciate the offer. In fact a friend of mine has a son who lives in Colorado. He has a ranch in some small town near Pueblo. Is that anywhere near you? Mike - I just checked the map. Pueblo and Berthoud are about 150 to 160 miles apart. Dave, thanks. It would take me one day just to drink coffee and visit and then a day on Ruckstells and a day on Carburetors. Maybe somewhere down the road. But be warned, you get Regan and me together and you might have to add a day. If you look at the tubes from small drum and big drum axles you will see that the tubes from MOST of the big drum are slightly thicker than the small drum. 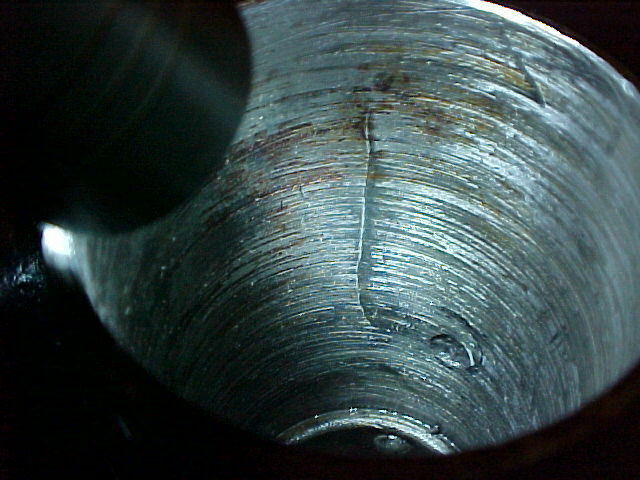 The outside diameter is the same but the thicker tube makes the inside diameter smaller. The area where the sleeve fits into the big drum was machined out to the same size as the earlier small drum tubes so the same sleeves & bearings could be used. What you are seeing are the machining marks from the boring tools. Most of them are very rough and will need to be smoothed out to accept the O rings used on safety hubs. A lot of them seem to be a bit small anyway and it is a lot easier to install the safety hubs if they are smoothed. I use a sanding drum on an air drill to clean them up. I think it must have been a running change, there are other slight differences in the big drum backing plates and I think the tubes must have been made thicker after production started. What is wrong with a stock rear end? It really is just one tube, as Stan and others suggest. I also would not like to see those cracks. I would hunt up a new housing I think. Nothing is wrong with stock, just that Mike doesn't have access to excellent original parts and is having bad luck with new axle shafts wearing out quickly. In his case, this is a good solution. Thanks for the replies. As I said earlier, I was guessing at the construction. 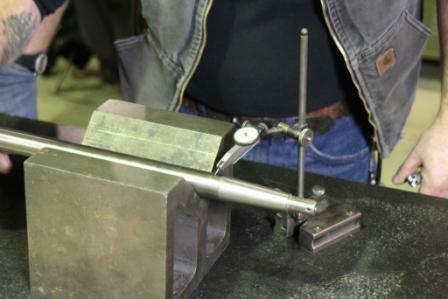 Last night I also talked to a local guy who is fairly knowledgable and he also told me that the axle tubes are one continuous tube and are machined on the outer end for the sleeve. 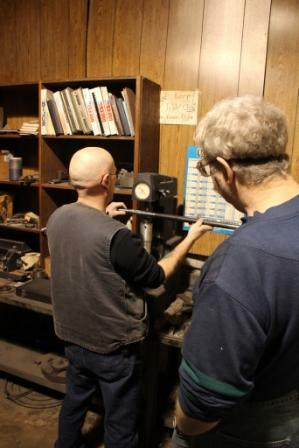 He also suggested finding a replacement axle housing. I was going to ask what are the differences between the 26/27 and earlier axle housing. Thanks for the explaination, Stan. If I can find an earlier housing I can remove the rivets and swap the backing plates. But, since the 26/27 uses heavier tube and I have a heavy TuDor, I'm going to look closely for the later one. I wanted to have a good rebuild this time. So I wanted to be sure that my axle housing was not bent. I placed the housing on a flat and with a couple of squares checked the exposed tube. The tubes were straight to within 1/32", using this method. I also purchased a new set of axles from Texas T's to use in this repair. This will be the third set of axles that I have replaced. I had a friend do a Rockwell test on the old axles and the new Texas T axles. We tested the axles in a number of places on the bearing surface of each axle. The old axles measured Rockwell C of 20. The new Texas T axles measured Rockwell C of 40. We also checked both sets of axles to be straight and both were. I concerned about the rear axle and want it to be bullet proof or as close as possible. I drive this car a lot. We'll keep trying.